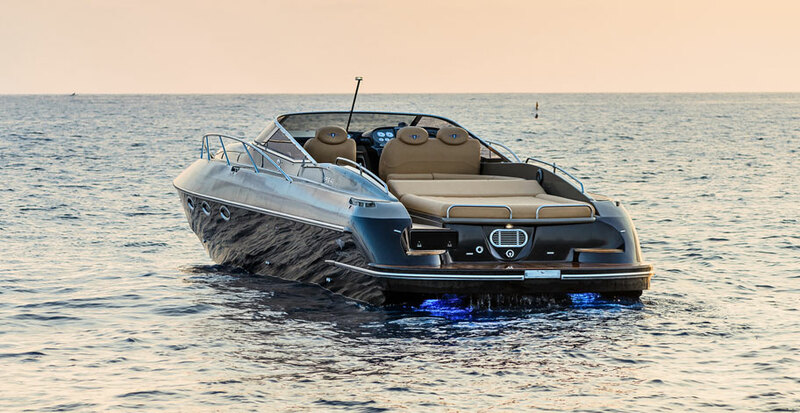 If the thought of being at the wheel of a fast motorboat with all the luxurIious trimmings sounds good to you, then the surprisingly economical Hunton XRS43 could be the motorboat of your dreams. These are halcyon times for the corpulent cruiser contingent; boats whose overwhelming purpose is to provide as much luxurious, attention-grabbing accommodation as possible. Nothing wrong with that of course, the fact that your holiday home is aquatic rather than on terra firma doesn’t mean that you should endure personal privation or a fashion catastrophe. At the opposite end of the boating spectrum, though, lie a tiny number of craft whose guiding light is the driving experience. Since the dawn of man, speed has been one of our species’ most enduring obsessions, and every fragment of the Hunton XRS43 has been designed and engineered to indulge that fixation. 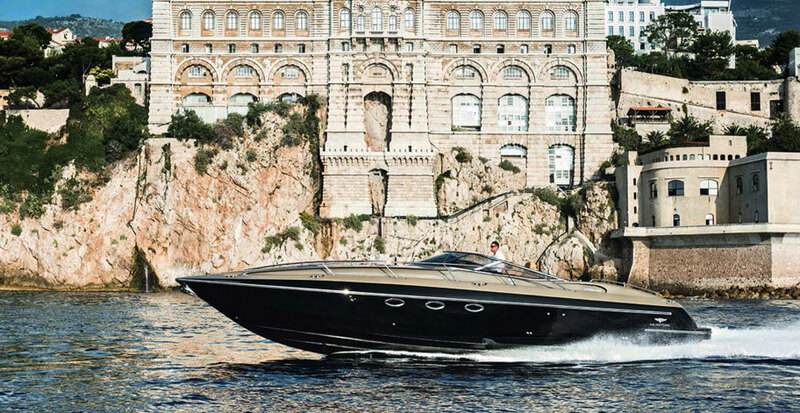 Of course, anybody can produce a sleek looking boat with a deep vee hull. It’s only when you get behind the wheel of the XRS43 that you appreciate just how much of Jeff Hunton’s design and racing background (three decades and countless trophies) has been distilled into this boat. Sadly, I’ve only driven the 60-knot version (humbug) and not the 70-knot monster with twin 662-horsepower mercury racing engines. Even flat out, it’s a remarkably easygoing experience. Stick your head above the swept back windscreen, and you’ll find a fierce reminder of your speed. But in the same way that a great sports car with excellent handling and a stiff chassis makes the high speed experience an easily controlled and less traumatic one, so does the stepped hull of the XRS43. It is true that some race bred stepped hulls (the XRS43 has two steps) demand great respect in the turns, with a sensitivity to trim that requires an expert touch. But even though my test boat sported slippery nxt surface drives that doubtless have less grip than the more conventional sterndrive versions of the XRS43, I never experienced any wayward handling. Hurling the boat into tight high-speed turns with little attention to the longitudinal trim? No problem. Okay, the XRS43 will reward those who spend time optimising the set of the legs and the trim-tabs. But this is not a boat that demands constant fiddling, and if you get it slightly wrong, it’s not going to bite back. Another reassuring aspect of the driving experience is the complete absence of creaks and groans, whatever the boat’s speed and whatever the conditions. During an earlier test on a non-stepped version of the 43, I was told off for driving too slowly! Consequently, I know that this hull not only flies along in calm conditions, it can also be driven at 40 knots directly into 1.5 metre head seas without a murmur. Having toured Hunton’s factory in the UK, I understand why. Down below in the accommodation, almost everything that does not move is bonded to the hull and the deck. Not just primary bulkheads, but every scrap of furniture too. Along with the substantial laminate weights that Hunton specify, the result is an extremely stiff monocoque structure. Although difficult to quantify, that rigidity can be felt out on the water – the XRS43 definitely feels stiffer and sturdier than most other boats. In line with Hunton’s willingness to customise almost every aspect of their boats, there’s a diverse range of engine options available. 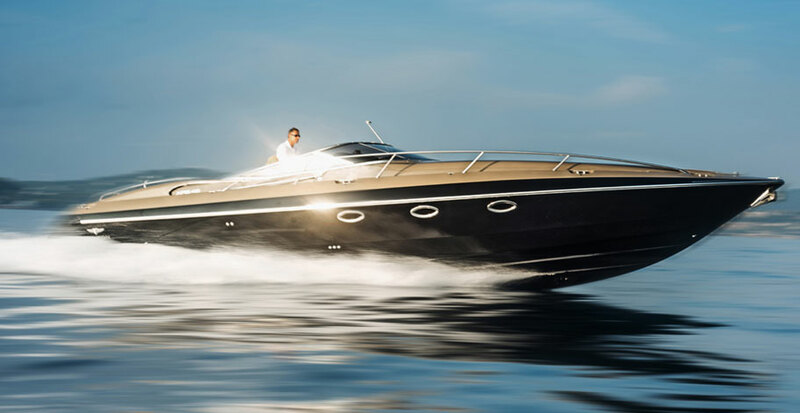 Hunton list four; two diesel and two petrol variants ranging from modest 370-horsepower yanmar diesel sterndrives to a petrol-head’s dream; a pair of mercury’s 662-horsepower racing engines. However, the british company are happy to consider anything that is reliable and will fit into the roomy engine bay. 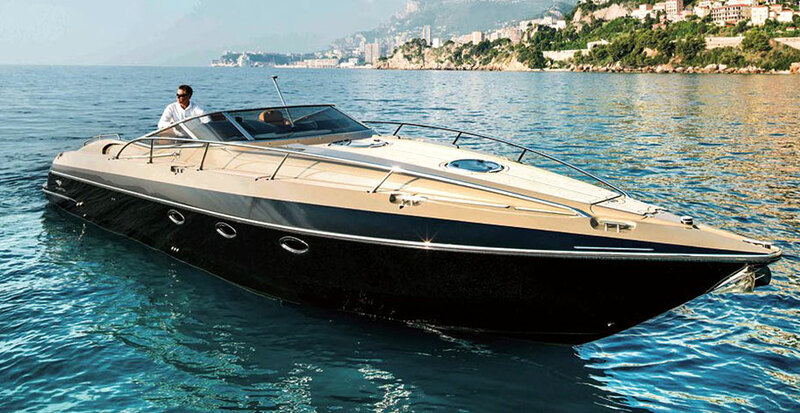 Whatever you pick – and even the diddy 370-horsepower sterndrives will whisk you to 50 knots – you’re in for a pleasant surprise. Own a snarling high-speed supercar even if you drive it slowly – and you’ll suffer sky-high fuel bills. Not so with the snarling high speed XRS43, which is blessed with a remarkably hydrodynamic and therefore fuel efficient hull. You would expect it to be far better than its corpulent cruiser counterparts; the shock is finding that it’s as good or better than a lot of its substantially lighter and far smaller sportscruiser siblings on a par with the better 35 footers. If you have an eye for figures, how does 99 litres per hour (1.8 miles per gallon) sound at 40 knots with a pair of 480-horsepower diesels? For a sturdy, eight-tonne, 43-footer, that’s positively frugal. 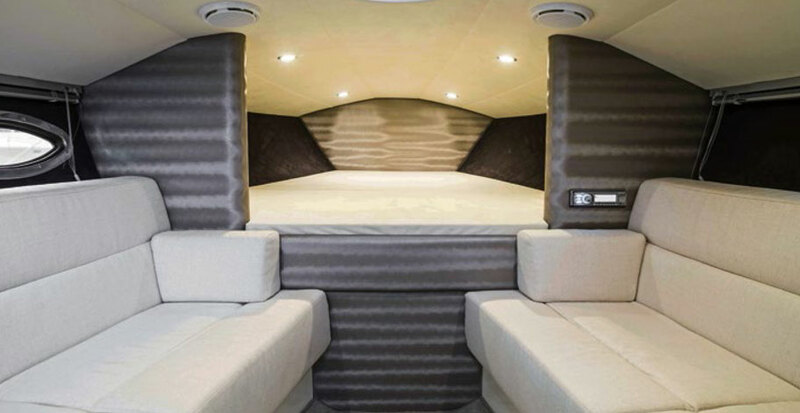 Don’t imagine that this brawny construction implies a rough and ready build; this boat is as slick and sophisticated as any sunseeker. The glassfibre mouldings are first class, with double skinned deck hatches and locker doors, as you would expect at this elevated price. down below, the door frames are assembled in the strongest way possible, with heavily radiused corners (ergo, less stress concentration) and robust finger joints. In the engine bay, everything is properly supported, with wiring and small pipes running through rubberised clips. in fact, everywhere you look, there’s evidence of a boat designed to endure the rigours of hard, high speed driving. My only surprise was finding single jubilee clips on a few of the piping runs – I’d been expecting universal double clipping. So who would buy a 43-foot boat with no more than modest accommodation for a coupe? In fact, the XR43’s appeal is wider than it first appears. With its terrific speed and superb hull, it has great potential as an-all weather, long distance cruiser. Most people meticulously plan long passages well in advance, but the XRS43 offers its owners the potential to spontaneously jump onboard when the weather looks good, and five or six hours later, be 250 miles away. If bad weather does appear, that’s going to be far less of a problem for the XRS43 than most. And with its remarkable frugality, those considerable fuel savings can go towards housing any surplus crew in a decent hotel. Of course, its greatest appeal is as an enthusiast’s driving machine. On the water, at any speed, it dishes up a magical interaction with the water that few boats can emulate.